We nemen opnieuw preorders, de nieuwe batch zal binnenkomen in mei/juni Update 16/04: er zijn problemen geweest met de printer, hierdoor is de nieuwe run verschoven naar mei/juni. 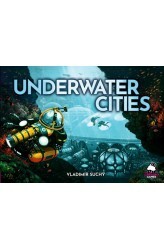 In Underwater Cities, which takes about 30-45 minutes per players, players represent the most powerful brains in the world, brains nominated due to the overpopulation of Earth to establish the best and most livable underwater areas possible. The main principle of the game is card placement. Three colored cards are placed along the edge of the main board into 3 x 5 slots, which are also colored. Ideally players can place cards into slots of the same color. Then they can take both actions and advantages: the action depicted in the slot on the main board and also the advantage of..
Dit is een upgrade pack voor Underwater Cities. 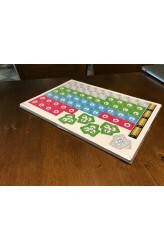 Dit pakket bevat dikkere playerboards en tokens. ..